My three dogs love these so much! Nice and large, so they stay occupied for hours! They also have this kind of smokey barbarcue smell on them, that leaves the dogs breath smelling nice! Good for cleaning the dogs teeth! The price is generally around $5…so for three dogs, it can get pricey. I buy them only as a special monthly treat! I give these to my dogs during the day so they aren’t constantly looking for something to eat. It gives them something to chew on without putting on extra weight. I do have a habit of overfeeding my little one. 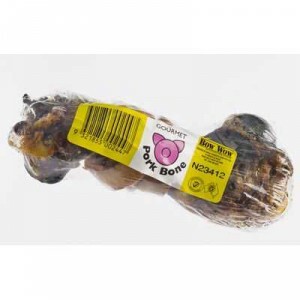 The Bow Wow Treat Pork Bone keeps the dogs busy for ages, there great for the dogs to give their teeth a real workout. How would you rate Bow Wow Treat Pork Bone With Rind?